We love this mold for making soap for visiting guests around the holiday. Professional soapers use it to craft soap for the hospitality industry. Once mold is used for making soap, it should not be used for food production. To avoid damage to mold, do not use sharp metal tools to cut or remove contents. Never place near an open flame, useunder a broiler, or on a cook top burner. Bar Cavities: 8 Bar Depth: 0.75"
Bar Length: 2.5" Bar Width: 1.5"
"Rectangle Guest Silicone Mold 1610"
COMMENTS: Good size for guest soaps and lotion bars. Perfect size for travel soaps or making a sampler of your soap products. I am thinking of making small batches of all my favorites and sell 4-5 in a bundled pack. Love them, I purchased 2 molds, may have to buy a couple of more in the near future. COMMENTS: Perfectly sized guest mold. Sturdy silicone. Used for M&P and also CP soap worked great for both. COMMENTS: love how easy it is to get product out of mold. COMMENTS: Love this mold! Perfect size for testing out recipes and gift giving! The quality is absolutely the best I've used. Will be purchasing more styles. COMMENTS: This is a nice size mold for my test batches. Soaps come out easily! COMMENTS: This is an excellent little mold for gift and/or guest soaps. I likethe simple, clean lines of the bars. COMMENTS: I love these molds. The only thing is that sometimes the fragrance oil smell is hard to get out. Soaps unmold easily. I will definitely be buying more. "Just what we needed. Ordering more!" COMMENTS: Just right. We needed a guest size for our product line. Will be buying more of these. 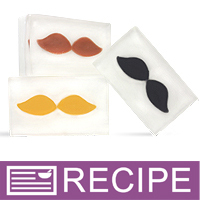 "Rectangle Guest Silicone Mold 1610 "
COMMENTS: This mold is perfect for soap samples or soap favors. I actually used this mold to make shower steamers. I like the shape because it is not the typical mold most use and prevents someone accidentally mixing up their bath melts with steamers. I love the rectangle style. COMMENTS: This is a great mold. It is VERY sturdy and is a true 2 oz. bar. Very easy to use and washes up beautifully. COMMENTS: As with all of WSP silicone molds. I LOVE IT! I love the curved shape as it fits in the hand so well and you can get a good grip on the bar. I think I own almost each and every one they sell. Yes! I definitely need an intervention! What can I say? COMMENTS: Received the mold yesterday. Great quality as usual. Planning to use it with weekend. Thanks WSP & Crafter's Choice. COMMENTS: I recently used rectangle soap mold for CP soap; it pop out so easy and the shape and size was perfect. I will definitely be ordering a few more. COMMENTS: This Silicone Mold is so easy to work with.. I just love it... size is perfect and my clients like it very much... I need to buy more. COMMENTS: Really like this mold. I plan on making a variety pack of 4 guest bars to use in my gift sets. COMMENTS: Love the size. Perfect for small size hands! COMMENTS: I ordered this mold to make travel size bars and it is PERFECT! So perfect that I had to order another one and plan on getting at least 2 more. This mold is easy to use, cleans well, and makes a perfect bar of soap. COMMENTS: I love these guest molds. They're the perfect size for sample and test bars. COMMENTS: Perfect mold for guest soaps. Very easy to use. Releasing the soap is a breeze. COMMENTS: The perfect size for making gift/sample size bars. They unmold easily and have a nice finish.
" Rectangle Guest Silicone Mold 1610 "
COMMENTS: Excellent product to make bars of soap products in the sizes meant for gifts, samples or travel size! Recommended to all!!! "Rectangle Silicone Guest Soap Mold"
COMMENTS: Love this mold! Silicone makes it easy to "pop" soaps right out! Makes a cute 2 oz bar! Easy to use and to clean! COMMENTS: Loving the size, just had a problem with it ripping on me. • Make it sturdier, ripped on me. COMMENTS: I love this mold for cute little guest sized soap. It is easy to get the soap out. I would recommend! COMMENTS: This is a nice mold. Small sized bars that are perfect for on the go. Lotion bars are great size! "Great look but NOT 2oz"
COMMENTS: I can make a full loaf and cut them into 1/2" slices and have very cute and little waste of soap. My guest love them and they are perfect to use as an extra mold for the left over soap to give as samples. COMMENTS: This mold ripped on the second use. I like the size of the mold and had high hopes. My first batch of cold process soap using the guest silicone mold came out great. When removing the soap from the second batch, the mold ripped. I guess I can still use it since it did not rip through the cavity, but it is not of the quality I expected. COMMENTS: Loved it! Great quality, good price. The silicone is thick enough to hold everything in place. No warping on the sides. Of course its small so there shouldn't be all that much warping even for a lower class mold, but if they use this same materials for the bigger ones, you'd get no warping or fat sides.. Seeing this results makes me regret not buying regular size and loaf size. BEWARE OF SIZE. Its 2 fluid oz size. Not 2 oz of finished soap. COMMENTS: I know it gives the dimensions but it is a little smaller than I expected. I guess make sure you really need this small of a bar before you buy. That was probably more my fault. COMMENTS: This mold is so easy to get my soap out of and my customers love the size as I call them a try me or guest size. Definately recommend this mold! COMMENTS: I ordered this product after using store bought plastic molds. This product has made my life so much easier and makes amazing soap molds! I couldn't be happier with the product. COMMENTS: This is my second one of these. I have made over 100 bars with my first one and have had no problems such as unmolding or tearing. They are great and I will continue to use. Thanks! COMMENTS: I love the shape and size of the rectangles in the 1610 guest mold and was disappointed that Crafter's Choice's guest log mold generates squares rather than the neat rectangles of the 1610. I've used them with a few drops of colored "batter" added and swirled with a chopstick to make nice little guest soap. The size is perfect for traveling, a generous sample, or a modest gift. I suggest using a good deal of sodium lactate to aid in mold release. I have had the lower corners stick even with 1-2%. COMMENTS: Great size for guest or sample soap. I'll be ordering more. COMMENTS: I had an order for guest soaps for wedding favors. this was perfect. the silicone mold made it easy to get the soap out and was the perfect size. COMMENTS: Love, love, love this mold! It makes the perfect little sample bars for customers. COMMENTS: I love every one of crafters choice molds. You will always find a use for them. Great release,clean edges. COMMENTS: These area great size for my wedding favor soaps! Great for large orders too that have embeds. COMMENTS: This mold works very well with M&P soap base. It's the perfect size to use for decoration or to give to your guest to use. Mold holds up very well and is easy to unmold your soap. 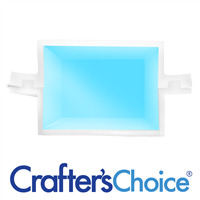 I highly recommend this and the other Crafter's Choice silicone molds...they make making soap SO much easier. COMMENTS: This is a great size for guest soaps. Customers like the rectangle shape, since it reminds them of the soaps from hotels, and one bar holds up for several uses. This is a great mold for samples and tests, too. I love how durable the mold is. COMMENTS: I have used this mold for both MP and CP. It holds up great after tons of use and makes the perfect size guest bar. In CP, make sure you add sodium lactate to your recipe so it will firm up and be able to be unmolded. Great price and great quality. I've never been disappointed by a Crafters Choice mold yet. COMMENTS: This mold is the perfect size for samples and party favors - enough for several uses. I'm able to pour exactly 1 lb. of melt & pour soap to fill this completely, each cavity is 2 ounces. I've had these for two years and they are still in the same condition as when I first bought them, even through hundreds of uses. An excellent value. "Amazing Mold For Melt & Pour ! :D"
COMMENTS: this is the easiest way to make melt & pour soap. soaps pop right out! "Great size for sample soaps"
COMMENTS: This mold is adorable and makes a nice 2 ounce bar of soap. Great for guest soaps, travel soaps. I made a batch of cold process soap and used this mold to make Luffa Soap. Worked out great, I simple cut the luffa in half and added one to each mold. Looks adorable. I will be purchasing more. Great to use when you have extra soap batter. Mold holds 10 ounces and would be great to use for test batches. Works great when layering colors as well. There is allot of room in the 2 ounce squares. Highly recommend. COMMENTS: This mold is so perfect for my sample bars. I waited to order this but wish I had ordered a couple extra. Will order it again. • perfect little soap bars. COMMENTS: I love this mold and I use it to make my sugar cubes and sample soaps All I use is crafters choice molds and I find they hold up real well and perform time after time. Thanks WSP! "Great design, shape & size"
COMMENTS: So happy to have found these at WSP! These are the perfect sized bars for guest soaps. Thrilled to have them in silicone! COMMENTS: This mold is great when I have a bit of M&P left over. I also use it for making samples of my soaps. COMMENTS: This is such a great mold for making soap samples. There is just enough room to be able to do layers etc. This mold makes really cute soaps and everyone loves them. I am planning on buying a few more of these and also the square guest mold. "Will these fit into your soap boxes? " Staff Answer This mold creates 2 oz. bars of soap measuring 2.5" x 1.5" x .75" each. Our soap boxes are approximately 2.75" x 3.5" x 1.25" and are made to accommodate a larger bar of soap. "What size label will fit on these soap bars? How do I measure them for a cardboard sleeve? What size shrink wrap bag should I buy?" Staff Answer Labeling is a personal preference. We recommend purchasing labels after you receive the product so that you can get accurate measurements. Each bar measures approximately 2.5" x 1.5" x .75. These soaps fit in our 4 x 6 cello and shrink bags. "Can I use this mold in the microwave?" Staff Answer Yes, they can be used in the microwave in short burst. We have done this when cleaning out the molds to melt any leftover soap/wax. I would recommend no more than 30 sec. at a time.